First of, Happy New Month! Allen & Fifth will be featured in 2 events; one on March 6th and the other March 12th. If you can make it awesome...if not...still awesome. Just tell people about it and help spread the word. 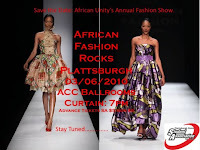 African Fashion Rocks Plattsburgh. March 6th 2010. ACC Ballroom. Starts @ 7pm. Afrik! Fashion Show. March 12th 2010. RPCC Multipurpose Room. Starts @ 6pm. T-Shirts will be sold on location.